Mailchimp vs Constant Contact: Which is the better email marketing service? Constant Contact is the one of the oldest players in the market. With the age, comes the experience of providing a high delivery rate and low spam ratio.With age also comes lesser reinventions and thus a not so cool user interface. Support can be classified as average. It provides more up to 425 customizable email templates. KPI’s and reporting data is very thorough, you can view bounces, complaints, opt-outs, CTA’s, forwards and social shares. There is no free version for very small-scale email marketers and beginners. Constant Contact pricing is monthly and is based on your number of email addresses ranging from $15/month for up to 500 addresses to $75/month for up to 10k. They also offer discounts for non-profits. if you know exactly what you need, have a top rated designer with you and thereby not relying on templates too much, this constant contact will be better for you. Sign up here or if you take my advice, check my review below to check Mad Mimi, which is one of the neatest and robust email marketing service in the market with a free trial. MailChimp again has more than 500 templates to choose from. They recently implemented a drag and drop editor for quick, easy email layouts. Many of their templates are optimized to display on mobile devices. You also have the option of coding your email directly with HTML and inline CSS. MailChimp uses an advanced open API and encourages other applications to integrate with it. SurveyMonkey, PayPal, FreshBooks, Google Analytics, Shopify and many more currently integrate with Mail Chimp. They also lend performance advice by comparing your open rate with your industry average and your lists average, which is a plus. If you are looking for a free email marketing software for simply using it as a email newsletter service, this may fit the bill, but not for advanced stuff and scaling up. Auto responder missing. A lot of restrictions on the type of campaigns which can be done. They score high if you are beginner looking for a free version, which offers up to 2k subscribers and 12 k mails. MailChimp has a number of monthly plans to choose from ranging from $10/month for up to 500 subscribers to $240/month for up to 50,000 subscribers. All paid plans have an unlimited number of sends. Nice clean interface, but a relatively newer kid on the block. May not be the best value for money as it is slightly expensive, the interface can get sucky at times due to forced sense of humour of the developers (it’s pretty good at times, but not always). If your key decision parameter is interface, support, ease, integration, and an option of a free version, this scores higher. But nothing can my recommendation that is to try check Mad Mimi, which is one of the neatest and robust email marketing service in the market with a free trial. It combines the best of mailchimp (with an even better interface) with the deliverability of constant contact. Mad Mimi is integrates with many other applications that will further propel your brand. A beautiful interface and great support. Surprisingly affordable. Even offers a free version for up to 2500 contacts. 3 plans beginning FREE for 2500 contacts, followed by a PRO which is for $42 for up to 10,000 contacts. Well suited for the email marketing players with a vision of grow and expand. Also offers the cheapest Jumbo plan which supports 100k plus contacts for a nominal price. One of the best players around, slick interface, fantastic customer support, great price, my personal favorite. Must try now. Highly recommended. Let me know your views, let’s start a discussion to see other’s learning’s on this topic. Aweber vs Mailchimp: Which is the better email marketing service? 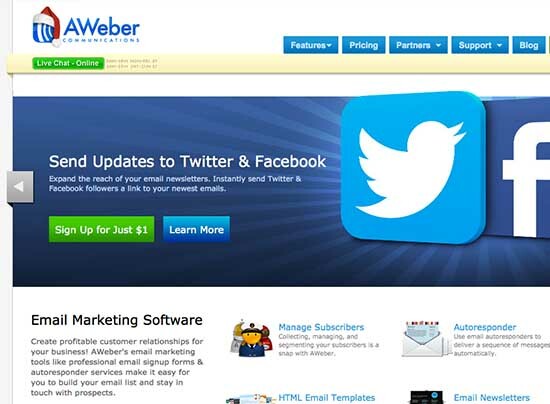 AWeber has more than 150 email marketing templates to choose from. It integrates with WordPress, PayPal, Eventbrite and a few others. AWeber also allows you to quickly segment your lists by subscriber opens or clicks, location, and even what pages subscribers visited on your website. Known to handle big volumes easily, good for professional digital marketers who would be able to create great email marketing solutions out of this . This provider has an option for custom HTML and also allows you to add attachments to your email. Ideal for bulk email marketing campaigns. No free trial (although $1 won’t hurt). No image hosting (Edit: now free unlimited hosting). AWeber offers a variety of pricing options, but their monthly plans range from $19/month for up to 500 subscribers to $149/month for up to 25,000 subscribers. If you want to send an email blast to more users than that, just ask for a custom quote. Nice clean interface, but a relatively newer kid on the block. May not be the best value for money as it is slightly expensive, the interface can get sucky at times due to forced sense of humour of the developers (it’s pretty good at times, but not always). If your key decision parameter is interface, support, ease, integration, and an option of a free version, this scores higher. But nothing can my recommendation that is to try check Mad Mimi, which is one of the neatest and robust email marketing service in the market with a free trial. It combines the best of mailchimp (with an even better interface) with the deliverability of aweber. One of the best players around, slick interface, fantastic customer support, great price, my personal favorite. Must try now if huge volumes is not a core requirement for you right now. Highly recommended.